There are few things that electronics like less than water. Get most electronic equipment wet, and it’s pretty much the end of life for that device. And that is with fresh water! If you should wander near the seashore with your iPod, chances are pretty good that it’s the first step toward getting a new iPod. So, what to do if you crave your music when playing near water or bashing the slopes on a snowboard? What if you plan on taking your iPod or MacBook or Laptop to places that would normally instantly void the warranty? We would recommend you start your journey toward water with a case from OtterBox. We tested a variety of their iPod cases as well as their laptop case, and found them pretty much indestructible. In fact, we think you may be more likely to be on your way to the nearest emergency room before you would hurt one of their cases! We tested the iPod case at the beach, in the pool, in the shower, and just cruising about the city. We even brought it sailing in the British Virgin Islands for two weeks. Every test situation produced the same boring results - nothing happened, which was a very good thing! The iPod inside was just fine, no matter what it was subjected to. Used in conjunction with the H20 Audio waterproof headphones (distributed by OtterBox), you could spend hours windsurfing while listening to your favorite tunes, and not worry one bit about your equipment. (Of course, you would still have to watch where you were going.) The headphones are a unique, behind-the-ear-and-over-the-ear design making them look a bit scary, but once they are in place, they really stay put and the sound is surprisingly good. After using them in salt water, I just rinsed all the gear off with fresh water when I was finished, and that seemed to be all the maintenance that was required. Note: it’s a good idea to take the cases apart and make sure they are clean and that the gaskets are free from sand and completely dry before your next outing. One feature we especially liked was the clear silicone ClickWheel cover, which allowed complete control over the iPod without the need to open it up and risk it getting wet. 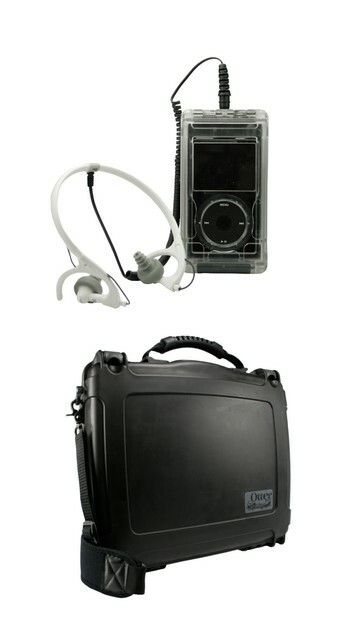 OtterBox offers the cases to fit most recent iPods, and the fit and finish were all top notch. They come with a bombproof warranty, so if a case fails for any reason, the company will replace it with a new one. One feature we liked was that every headphone or earphone we used with it worked perfectly. This isn’t a small point, since other waterproof cases that promised protection usually impeded many of the mini-jacks. The OtterBox design allowed unfettered access to the jack, making life much easier. The OtterBox Rugged Laptop Carrying Case is, by necessity, designed for a more specific user. At 6.75 lbs, it’s not a case to use everyday, in my opinion, but a wonderful way to insure your laptop gets to where it’s going intact, no matter the weather or travel conditions it might encounter along the way. We have reviewed other cases that promise to protect equipment in the event of a short drop, or a serious downpour, important qualities worth looking for. However, the OtterBox case is in a class by itself, tough as nails, with a nice rugged design. If James Bond wanted to protect his MacBook Pro and keep Q happy, this is the case he would choose! One of the features we liked best was a unique way to custom fit the case to your laptop. In most products, this is simply a set of foam pads with Velcro to fit the unit to the case. In the OtterBox design, there is a layer of Velcro inside the case, and the unit ships with a variety of hard plastic corners mated to a flat plastic piece with Velcro on it, so that you place your laptop in the case, then snug up the corners to your laptop and then use the Velcro to hold the corners in place. This isolates the laptop from the edges of the case, and floats it in the center of the case, where a cushion of air protects it and far better protected then other designs that often let sharp blows to the case reach the laptop. It also has a nifty rubber plug to allow you to run cables into the case, so that you can use the laptop and keep it in the case or, as I often do, let it charge (with the case open) while still being protected by the case. The OtterBox Rugged Laptop Carrying Case is the perfect way to protect increasingly fragile laptops, and yet still be able to take them places that your mother probably warned you about!